Note: You need to fill in your friend's address as the shipping address on checkout page. We will send this Gift Card to that address. Can't decide which of our great range of products to get for your friend or family member? 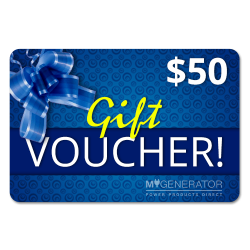 A My Generator Gift Voucher is the perfect way to let them choose the right item for themselves! 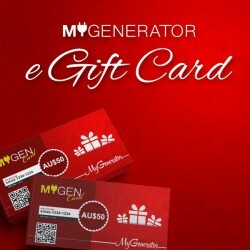 My Generator Gift Vouchers ordered online are an electronic voucher that will be provided via email to the recipient nominated during the check-out and payment process. Please Note: Gift vouchers will be sent electronically to your email of choice. No physical voucher or card will be sent out.